Hotel Selsky Dvur - Sivek Hotels, Prague. 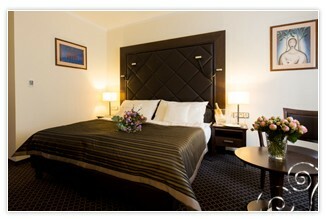 Selsky Dvur - Sivek Hotels Hotel Prague. The Hotel Selsky Dvur is found just 20 minutes outside the city of Prague in lush green area, perfect for rejuvenating. The unique historical building is a protected landmark on the outside, and on the inside it offers the up most in technology to guarantee the guests a comfortable stay. The rooms are comfortable and offer high quality amenities such as internet connection, pay TV and air-conditioning. For a really special treat, by reserving ahead of time, you can try one of there unusual dishes of crocodile, ostrich or kangaroo. The hotel also has a wellness centre that provides wellness treatments along with the traditional sauna, solarium and swimming pool.